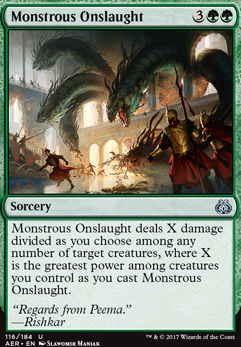 Monstrous Onslaught deals X damage divided as you choose among any number of target creatures, where X is the greatest power among creatures you control as you cast Monstrous Onslaught. I'd say Victimize should work better than Rescue from the Underworld. I love my curves to be low, so 2 cmc make a lot of difference to me. The only upside I see in Rescue from the Underworld is that it is instant speed. It doesn't really matter if everyone agrees to attack you once you cast Tombstone Stairwell. All tokens are sacrificed at the end of each turn and then everyone gets new tokens during the next upkeep. That means only one player can attack you with his tokens each time and you will always have your own ones for blocking. if there's only 5 creatures in all graveyards at the time you play Tombstone Stairwell you will +10/+10 Kresh the Bloodbraided each turn! In a four player pod that means Kresh gets +30/+30 until your next combat step! I'd cut either Monstrous Onslaught (I don't like that you can't target players with it) or Rite of the Raging Storm (does practically the same, only worse) for it. You know, it's funny. Because of the cheap spells and interactions, I've gotten him out the 3rd time (maybe even the 4th) for and was able to make things happen. With it's 11 ramp cards and things like Dark Ritual and Burnt Offering, I've, in most cases, had the strongest mana setup on the board. However, even though I can still steal people's creatures, attack, fling - you are right. I like Skeletal Grimace best, I think - though when I Fling Kresh, I'd lose it. Maybe a Darksteel Plate would be most valuable in this deck? Glaring Spotlight can make my guys hexproof for a cost (and is also another "unblockable" granter I forgot to list). Regenerating him or making him indestructible would definitely make Monstrous Onslaught better. As for the tutors. You're right that there's a fair amount of overlap, and with the solid card draw, something's always within reach. And I've kind of enjoyed that style in this deck - having to get creative and leverage what's available to make something happen. I've found it more creatively challenging, exciting and satisfying when I could pull of the win rather than always having the perfect card within reach. That being said, I am really giving serious thought to putting in Birthing Pod, Pattern of Rebirth and Rune-Scarred Demon because they accomplish the tutoring while providing great synergy being a sac engine, sac value, or giant creature to sac :). What do you think would be removable for adding these? Well this is definitely a new take on Progenitus and I like it! Progenitus energy?! Never thought to do that. I am working on a Steampunk deck that plays artifacts and energy with Ramos the Tank Engine dragon as its commander ... but this is just weird and wonderful. A giant Hydra working with energy ... you really have got imagination. I do have a few suggestions you might find worthy of consideration. 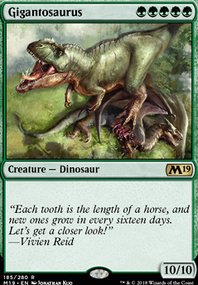 Monstrous Onslaught is worthy due to the amount of creatures you play. Since you play with energy, Consulate Turret should be a worthy candidate to go into this deck. Lifecrafter's Bestiary permits card draw. But ... other than that I have no idea what you are going for. Hope these suggestions have helped and I would love it if you have a look at my Greek mythology deck, which has Progenitus as commander. Hedron Matrix,Fireshrieker, Grappling Hook and Grafted Exoskeleton are all potential win conditions. 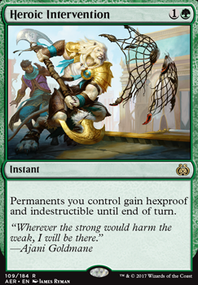 Try to ramp as much as possible and some landfall creatures like Rampaging Baloths can bring great benefit of such sorceries even in late game. Also some mass removal like Monstrous Onslaught for mono green can be a bless. 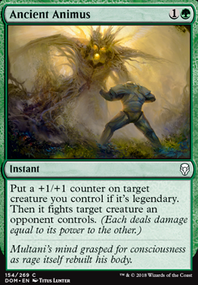 For instants you might like to look at Evolution Charm, Setessan Tactics, Crushing Vines and Krosan Grip. In case your meta has lots of boardwipes consider Wrap in Vigor and Fresh Meat for cheap options. 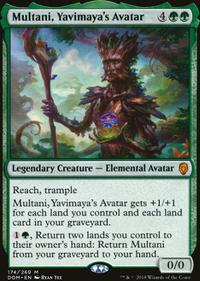 As for enchantments, most good green enchabtments are expensive, but cards like Elemental Bond can bd crazy good. If you can spare $2 you could also get a Vernal Bloom. Your deck is a touch weak on card advantage. By which I mean there isn't any. I see a couple things you could do. 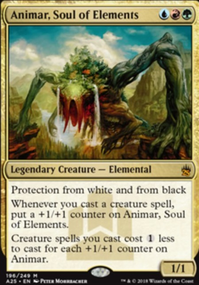 Cut the Elvish Visionarys and Monstrous Onslaught and pick up either A) 1-2x Rishkar's Expertise, or B) 3x Elemental Bond. Love the deck! Don't know if you missed the card Monstrous Onslaught, but it seems too insanely good to not play it. It's basically a green onesided board wipe in this deck!